In the spring of 2011, GoGo Jean brought a proposal to 4Gs for a new project she called, "Spirit Jars". At the time, pennies were being phased out of our currency. "Let's collect pennies over the summer for the African Campaign." Jean reminded us that we have the luxury of enjoying summer holidays and inviting our grandchildren for short periods of time, a luxury African gogos do not share with their 24/7 responsibility for their grandchildren. She suggested this as a way of being mindful of their burden during our summer break. Spirit Jars are simplicity itself, . . . no meetings, no planning, completely voluntary and shared fundraising. 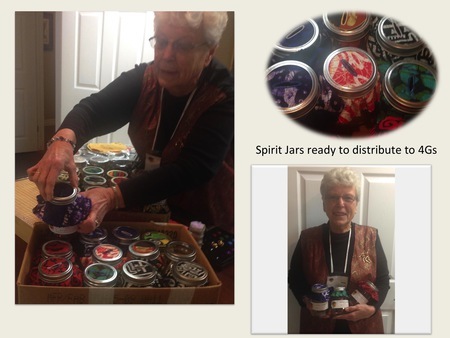 We unanimously endorsed Jean's proposal and each of us took one or two jars to be returned after the summer. That first year the donations totalled an impressive $900.05. The jars, with swatches of African cloth on top, are not only visible reminders of our sisters in Africa, but also spark conversations about the Grandmothers Campaign and the Stephen Lewis Foundation. Thank you, Jean, for this simple and effective project that helps us to help them.